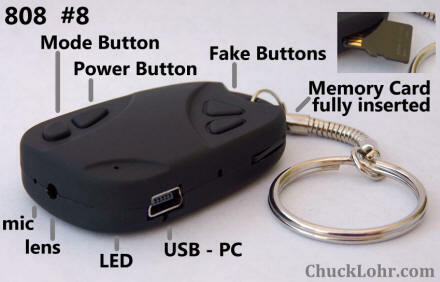 The #8 is one version of the 808 car keys micro camera. I have a #8 on order and will review it when I receive it. Received 101019. 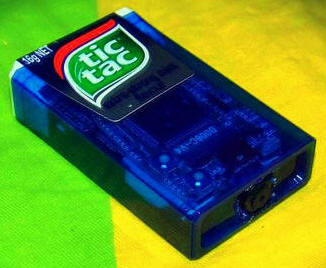 SmaRkieS made this mod that fits an 808 #8 and a Nintendo USG-003 1000 mAh external battery into a tic tac box (16g). See the full description here. A.J. comments about his 808 #8. One issue I noticed with VirtualDub is the old problem of video levels. The MJPEG avi files contain full 0-255 RGB levels which seem to come into VirtualDub expecting levels of 16-235, resulting in "crushed blacks" and "clipped whites". I attach a JPG to show the difference it makes to open the file indirectly using a simple AviSynth avs text file, getting back low black level and bright white detail - the correct contrast instead of too much. Notice the washed out white blanket gets a lot more detail back, also the dark areas on the bin. http://www.youtube.com/watch?v=-xRGy2eShKM - 110509 sample #8 video with the 808 taped to the hood of a Jeep. 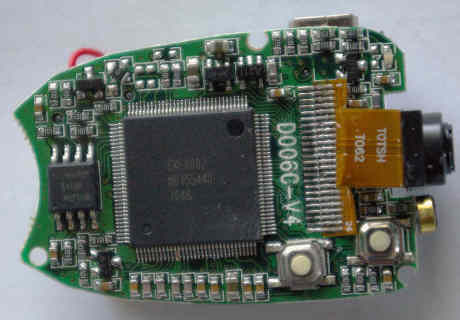 Class 2 micro SD card. http://cyclurba.fr/forum/134854/camera-solution-chere-tres-efficace.html?discussionID=5664#msg134854 - 110613 Project to replace the internal #8 LiPo with an external Casio NP-20 690 mAh (Li-Ion). Wim contacted me to report that Hyundai (Hyundai Technologies Handels GmbH, Vienna Austria) is selling the MC1010 which seems to be an 808 #8 camera. The webcam driver that Hundai is supplying is for the 808 EKEN #8 camera. If you download the timesynchronization files, it is a zip file with EKEN.EXE and EKEN_V0.0.03.EXE in it. Until now, no "name brand" has associated itself with any version of the 808 camera. I doubt that Hyundai has anything to do with making the camera. Google Hyundai MC1010 to find links. Boris received a #8. Photos below. "I still convince my camera to work in a webcam mode. I can see webcam in my control panel and in device manager but i cant get any picture from it(W7-64) I adjusted time using EKEN_V0.0.03.EXE but you have to run the file as administrator, regular left-hand clicking doesn't work, so, it works under W7-64bit. 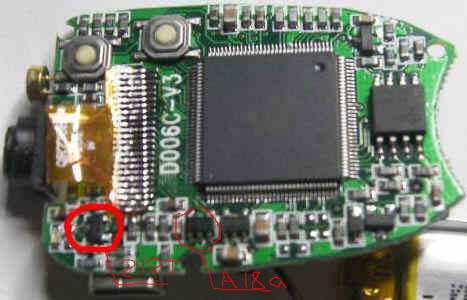 I add pictures of pcb from both sides and picture of W7 desktop watch with camera." 110329 - Allen reports that when he imports the 808 #8 AVI file into Adobe Premier Elements V8, the video and sound are out of sync. He was able to work-around this problem by importing the AVI file into Windows Movie Maker (WMM), encoding to DV-AVI, and then importing the DV-AVI into Premier. No sync problems. 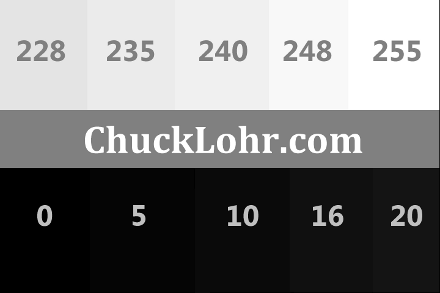 Comment by Chuck Lohr - The 808 #8 camera is strange because it does not use PCM audio like most other 808 cameras. The #8 uses an audio ADPCM U-law codec. That is probably causing problems when the #8 AVI is imported into Premiere. VirtualDub could be used to replace the ADPCM audio with PCM audio (no video re-encoding). Then the #8 AVI might import into Premier with no problems. 110226 - It seems that there might be two different #8 cameras and each uses a different webcam (maybe just firmware differences). The webcam hardware ID is either 04FC 3058 or 04FC 2843. My #8 camera uses webcam 04FC 3058. No matter what I do, I can't make it 04FC 2843. 04FC 3058 The EKEN webcam driver works with hardware ID 04FC 3058 only. 04FC 2843 Reports are that there is a way to put the camera into a webcam mode (hardware ID 04FC 2843) that does not require a driver. I'm happy to report that I found a way to get my #8 to work as a webcam in Windows XP SP3, as ELM70 suggested. Hardware ID 04FC 3060 - This is the original #8 webcam hardware ID. It works with the EKEN 04FC 3060 webcam driver. Hardware ID 04FC 2843 - It seems that some #8 cameras are being delivered with this webcam hardware ID. There is currently no 04FC 2843 webcam driver. If your camera has a webcam hardware ID of 04FC 2843 then contact their camera seller or EKEN and ask for a webcam driver. I don't know if a driver exists. [ 3243.661481] uvcvideo: Failed to query (129) UVC probe control : -110 (exp. 26). Evgeny reported that his #8 camera would turn on just by bringing his hand close to the camera. He replaced a part and fixed the camera. "I have camera 808 # 8. at begin camera worked well, but sometimes switched off. when connected to the charge on the USB. then it ceased to be included on the discharge did not respond. unsolder the battery, put back - have begun to include, but trying to make a video - Shut off. noticed that if I'm close the transistor for a few seconds, then camera turns on and works fine until the next shutdown. transistor seems broken, because central contact and the contact on the right - 1 ohm." "My camera #8 start fail. I found the cause. During charging broken down voltage regulator 1.8V, marked as "A18a". I replaced it and the camera work ok."
Many people have reported that their #8 camera will not turn on. It happens with my #8. Reset will not fix it. If the camera is USB connected for a short time, when disconnected the LED flashes, the LED turns on and the camera is OK. If the camera is USB connected for more than a few minutes, when disconnected the LED immediately goes out and the camera will not turn on. The camera can't be turned on. The LED is off and pressing any button or the reset will not turn the camera on. This is a common problem and I don't know exactly what causes it but there is a fix for it. Connect the USB cable until the LED turns on, then immediately disconnect. Q. How can I fix this problem if I'm not near a computer USB port? A. Carry a USB emergency charger. The 5V on the USB connector does the fix, so any USB port that has 5V will work. 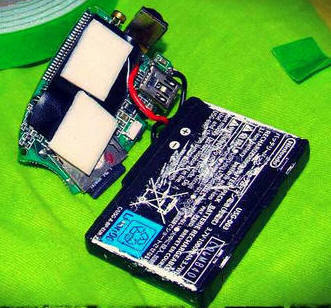 The USB emergency charger works to fix this #8 problem and will charge the 808 battery. Audio periodic noise - The camera injects noise every 1 second in the audio stream. I recorded a 1 kHz sine wave. The noise is still there but it is not obvious from visual inspection of the waveform. At 1kHz 16 samples per sine wave is very coarse. Setting the video date time stamp - How to set the date time. The 808SetClock program (ver 1.3.1) does not work. Remove the micro SD card while taking a video - A file name EKEN0009.avi of length 1,048,576,000 bytes (0x3E800000 bytes) is created. This file is a corrupted AVI file that does not play, but can be opened by VirtualDub. The index table is corrupt and VirtualDub reconstructs it. The file, after the point that the card was removed, contains sectors from an old #3 camera AVI file. Strange. 101019 - Bill reports he received a #8 from linjiechong, but the seller listed a #3. The VID/PID is 04FC/3058 although sometimes I see 04FC/3060. (3058 is the webcam and 3060 is the mass storage device). The camera does a close and continue when doing a long video. I typically see files sizes between 0.3GB and 0.5GB. Something not mentioned before - there is usually a 6 to 7 second gap between the close of one file and the start of the next (using the timestamp as the measuring device). I see a LOT of dropped frames. For example, in a video with 14116 frames (7 min 50 sec), there were 4710 dropped frames. This was done using a Kingston Class 4 card (4GB). I haven't measured the battery life yet, but it's at least 48 minutes. That was the length of a recording that I made without fully charging the battery. The camera produced 8 files totally slightly less than 3.2GB. Carl created this YouTube video comparing the #3 and #8 camera. This is my opinion: I'm thinking as far a video quality goes it's a toss up. Both cameras hunt for the correct exposure, the color balance of the #3 seems a tiny bit﻿ worse (purple trees), the horizontal motion blur is identical, the color and sharpness of the #8 is outstanding at the very end (wood shed). The audio quality,﻿ not demonstrated here, is much better in the #3. 101008 - Ed reports that his #8 records multiple AVI files of various sizes, and the battery lasted 83 minutes in the following bench test. I charged the #8 camera for 65 minutes and let it record outside until the battery died, it saved varying file sizes. Battery lasted 1 hour 23 minutes 36 seconds 3,881,597KB memory used at 46,480KB per minute on Class 4 Kingston 8GB card Case temp at the end of 65 min. charge was 99.7 degrees on top cover in a 78 degree room. Sound is definitely bad, video is pretty good. David at bazaarlee.co.uk has posted YouTube videos comparing the #3 and the #8. He sells the #3 in the UK, and he ordered a big batch of #3, but got a big batch of #8. David will be retesting with a faster flash card. Quite frankly I find the #8 to be pretty bad. The audio has a lot of blips/ pops and so does the video, plus several #8 tested seem to have a weird over/under saturated phasing going on through out the video, (the #8 bellow was a better sample). The #3 still seems to be superior. Going by what I've seen with the #8 I am not going to be selling them and will be returning a batch of 30 to my supplier. Which may be trouble as I think they have done a runner, as they have suddenly gone from selling 1000+ items a month on ebay to private feedback and 0 items available. Here is a #3 and #8 video comparison. 100928 - Clemens in Germany received his #8 camera from eBay for-easy-life. He requested a webcam driver and it was sent to him. The driver is large (6 MB). I don't have the bandwidth to host it. If you want it by email, email me a request. I have two confirmations that it does not work with Windows 7-64. Here is the #8 webcam driver. When the USB is connected the camera is in mass storage device mode. Short press the power button and the camera will switch to webcam mode. Another short press will switch back to mass storage device mode. EKEN_V0.0.03.exe - This is a tool to set the time of the internal clock, it worked. Just plug the camera in and execute the program. 100927 - Alchemist sent me information about a new camera version. It has enough unique features to be christened the #8. ● The video date time stamp is yellow on black. ● The audio is ADPCM u-law. All other versions have been PCM. 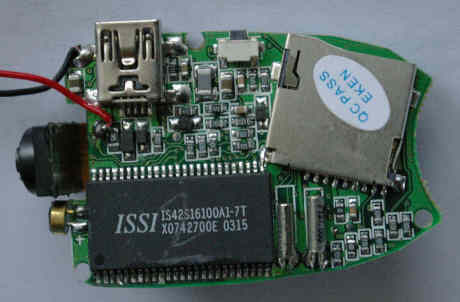 ● The processor is labeled EKEN002, but based on the PID and the quality, it is probably a SunPlus processor. 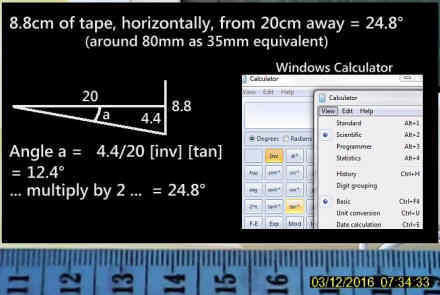 ● There is little to no aspect ratio distortion in the 720x480 video and 1280x1024 photos. ● Hardware ID (VID PID) of the #8 webcam is 04FC 3058. The #8 has the same VID as the SunPlus cameras #3 and #6 (04FC 1528). #8 button, top side. D006 is the EKEN camera model. #8 processor labeled EKEN002. Probably a SunPlus processor. Processor is marked EKEN002 M0090100 1033. Evidence is that EKEN is the camera manufacturer and SunPlus makes the chip. AVI File byte rate High data rate. 86 megabyte per minute. Similar to the #3 camera. Taken from a 13 second video sample. Audio codec ADPCM u-law, 16000 samples per second, 8-bit, 128 Kbps. First 808 camera to have ADPCM u-law codec. First 808 camera to have a 16000 sample rate. Similar to the #1 and #7 cameras which are 128 Kbps. The audio fidelity you would expect with no strange artifacts. High video quality The video quality is not very good. Similar to Worse than the #3 and #6 camera. Stamp disable unknown I don't know if the date time stamp can be disabled. Webcam There is a webcam driver unique to this camera. See above. Upscaled video From a video frame grab, like the #3 camera, the 720x480 AVI seems to be upscaled from 640x480. Round objects in the sample video seem a little stretched horizontally. AVI has large junk section One strange note about the #8 is that in analyzing the 23.2 MB sample AVI file there is a large empty junk section (about 15% of the file). When run through VirtualDub in "Direct Stream Copy" mode, this junk section is removed and the resultant file is 19.8 MB. eBay kkwvfp was claiming specifically to be selling the #3 but it is not. In his listing he wrote: "It is #3, Date time color is yellow, stamp on lower right"
But it turns out it is a new 720x480 key cam altogether.. So that's 1.69Gb over 80m 04s on the "as supplied" 200mAh battery. "Close and Continue" recording every 1Gb. #3 timestamp is larger on a transparent background. In the very short test I gave it, it's not quite as sharp as the #3 (which is very good) but otherwise comparable in most aspects.. poor lowlight similar etc. This work by Charles E Lohr is licensed under a Creative Commons Attribution-ShareAlike 3.0 Unported License.